A food dehydrator is a device designed to remove water from food for preservation. The technique of food drying has been used for many years. The use of food dehydrators has become more popular with the increase in the population percentage knowing the importance of a healthy diet. Dehydrating food removes water that is essential for the growth of bacteria, you are, therefore, sure that your food will not decompose soon. It is cheaper to store dried foods than having to keep them fresh in a freezer or fridge. The process of drying takes between four and twelve hours which is much less than the time fresh vegetables take in the freezer before they are used. Using a freezer, therefore, wastes enormous amounts of energy that if saved could contribute to a greener future. According to professionals, a food dehydrator is known to help people under weight loss programs to avoid snacking on foods detrimental to their weight. Instead of going for fries, one would rather snack on healthier banana crisps or dried apples with fewer calories. By drying your own food, you will be sure that your food is free from preservatives and food additives. It, therefore, reduces your sugar and salt intake. This can be important to those individuals concerned with their blood sugar level and blood pressure. Apart from the calorie factor, consuming dehydrated food has shown that it can increase your consumption of vitamins and minerals. If you have those children who dislike eating greens, then purchase a dehydrator, it will get them encouraged to eat fruits and vegetables in their crunchy unsalted forms. This is one of the major benefits of using a food dehydrator. Unlike most food preparation processes like steaming and cooking, you are not going to lose any nutritional content in the food you have dehydrated. Although you might end up having delicious food, most of the concentrated nutrients and enzymes get lost when you cook or bake food. Dehydrating food maintains almost 100 percent of nutritional content of the food. If therefore you are about healthy eating, a dehydrator should be present at your home. Dehydrated food has up to 75 percent of moisture removed. This means bacteria (a major food spoiling agent) are not going to grow in the food. To cater for the remaining 25 percent moisture, you can employ techniques such as using airtight containers where these foods can remain fresh for as long as up to 30 years! If you reside in a remote place, then a food dehydrator can be a real lifesaver. After dehydrating food, reduce their size by a factor of three to sixteen. Imagine, 76 tomatoes can fit in a single quart jar after drying. The weight of dried foods also reduces by a significant 85 percent which was mainly water. It, therefore, means that you can carry your own food anywhere you go. Good thing is that, although the food might seem little, the nutritional value in them is high. For busy people or travelers, then a dehydrator can be beneficial. 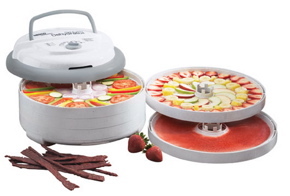 With a food dehydrator, you are going to preserve the food that would have gone to waste. It will assist you manage a bigger garden or even accept some garden products from your friend without having the fear of discarding excess produce. Also, with dehydration, you are not going to depend on the packaged, processed foods which translates to a lesser disposal of boxes, cans and paper bags. Dehydrated food requires little to no attention. With containers such as empty butter containers, you can store them and just occasionally check if they still as dry as you want them to be. The process of drying is not involving, you can put your food in a dehydrator during the day or at night before you sleep. The process is pretty straight. Just purchase your supply of fresh fruits when they are available, dehydrate them, and have a continuous supply throughout the year. Stock most of the supply and you will always have enough on hand. You can also make your beverage or juice using ground fruits from the dehydration process. This will allow you be more flexible with your food products. Dehydrating your own food is critical especially if you lead a busy life. It also allows you to carry food around, or even store a supply enough for more than a year. For you fighting weight issues, the dehydrator can be a real friend in assisting you drop those extra pounds. Consume dehydrated foods for development of a healthy body.